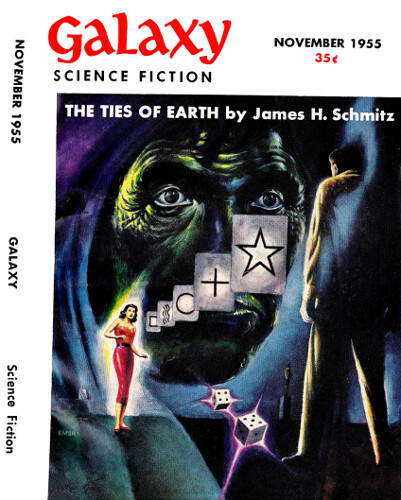 Galaxy Science Fiction November 1955.
but could I follow it up with an encore? About this thing, I couldn't stand to have them laugh. Not the way they did about the swimming. "Oh, come now. No one could learn to swim by reading a book. Five-eighths of a mile the first time in the water!" And they laughed. I guess I laughed, too. More than any other thing, I've wanted people to be happy. But I never swam again—only that first time. I've always read a lot and sometimes things I've read do get mixed up with things I've done. But the things still happened—they happened to someone. And people ought to believe. I'd like to tell people now. I'd like to say, "I died once." But if they laughed, it might be later and I'd never hear them. Already there are too many silent things in this. There must be no silent laughter as well. They might think I've got myself all mixed up with things I've read. Things like surgeons pumping life into a heart to bring the patient back after he's died on the operating table. Doctors reviving dead soldiers, if they haven't been gone too long. It's not like that at all. I was truly dead—for three days. It was almost too long; I suppose I made it back just in time. I don't know. My reading was what started me on this, just the same as with the swimming. When I think about it too much, I almost feel myself that I am exaggerating a bit. But I have proof, proof which no one has ever seen but the doctors and those who found me. See how they keep me swathed in these cloths and how the darkened room hides my eyes? Anyway, I'd be ashamed to show myself, for the mark of death is too terrible and people would be even more afraid of dying than they are now. You see, I could have done it in the winter, only I was worried about the cold. I might not have been able to get back at all. But it was too warm when I chose to do it. I should have known better. I've read a lot about keeping things. You can't preserve them in the hot weather; that's why the doctors put those dead soldiers in ice chests, but I didn't think about it enough. I made some other mistakes, too, but I couldn't have known. I guess what started it all was something I read a long time ago, perhaps in a story, or an agricultural bulletin, or maybe in an encyclopedia. Anyhow, it was something about pigs being able to just die if they want to. That always stuck in my mind. It's a pretty wonderful thing, you know. Imagine just being able to die if life didn't seem worth living, or if you were lonely, or maybe just because you wanted to. Oh, I told lots of people about it. You know how sometimes a lull comes in a conversation. Then I'd say, "Pigs are able to just up and die if they want to." But nobody ever paid any attention to me at all. They seemed to ignore the remark. One man did say once, "What the hell are you talking about?" but even he wouldn't listen when I tried to explain. Perhaps it was just too improbable. Besides, people don't like to think about death. They talk about it sometimes and sometimes they brood about it, but they never really think. It has always been too unknown and that frightens them. Then they only fear and stop thinking. It always did seem sad to me that no one had ever tried to help people out about death. Yes, I know one did. He died and came back—but then He wasn't just a man like you or me. And even He never said exactly what it was like. I wondered if anyone really ever had said. So I began to read with only a single purpose in mind. I had to know so I could tell people. If they could only know, then they wouldn't have that fear and we could talk of death and still be able to laugh. But I had read it all when I read of Jacob's dream, for that's all there was—dreams, visions, hopes. 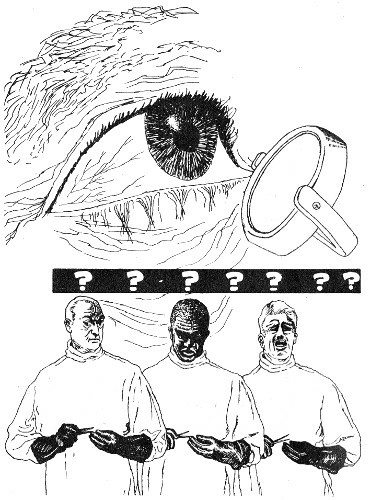 No one had ever seen and come back to tell the others. The question then was why, not what. It couldn't be that all who died had no whole being to return to. Not every death is marked by a body completely uninhabitable. I myself had heard a doctor say, "There is nothing organically wrong now. The patient will recover if only he has the will to live." The will to live! Suddenly I knew I had found the way. I myself would go and see and return to tell them all. I answered all the requirements. I had a healthy body to return to. I had the will to live, for I enjoy my reading and acquaintances. And I alone had thought it wonderful that pigs can die when they merely want to. I knew that I could, too, and I was not afraid. Very carefully, I began what seemed almost too simple preparations. Drawing some money from an account I kept for medical expenses (at the time I thought this very amusing), I bought an electric clock which registered the hour and the day of the month on cylinders like those on a tachometer. I felt I would want to know exactly how long I had been deceased when I came back. Next I secured a small round mirror with a concave face, the type some use for shaving. This I was to hang directly above my face. It was merely vanity on my part, for I wished to say that I as well as Lazarus's friends had seen a dead man rise. I had assumed that at first my vision might be blurred and thus the magnifying effect of this particular glass would, I thought, help me focus on my face. On my study floor, I prepared a pallet. It was neither soft nor hard, just a comfortable support for the body I was to leave. Beside it I arranged a basin of water and some soft cloths, for I would want to wash right after coming back. You see, I did not fear the obvious. My power lay in thought and I proceeded systematically. Drawn blinds and two small night-lights spread a gray cast over the room, a cast that I was to know too well. Everything was ready now. No, wait! Quickly I placed a tumbler and a decanter of brandy within easy reach and by them laid a pencil and a pad of paper. It was when I straightened up that I first felt the pounding in my body. My heart pulsed as if it were smashing waves of blood through my veins. In my throat, the large arteries swelled with pressure until I thought I would strangle. I had to have some physical exertion to relieve the tension. I felt I might faint or have a stroke unless I moved about. My father had been stricken with an embolism at about my age, and I've read such weaknesses are inherited. So I walked about the house rechecking the locks of windows and doors. Perhaps it was just to keep busy for a few more moments that I even rechecked the pads of cardboard with which I had muffled the bell-clappers on both telephone and door chime. I don't seem to have had many callers for several years now, but I had to avoid any chance of being disturbed. Somewhat calmed by my exertion, I prepared to lie down, but a sentimental whim moved me like an automaton toward the window. It was the only really unreasoning thing I did. Like a prisoner denied the light on penalty of torture, I knelt down and looked under the blind. Never was the Sun so dazzling. This slightest lifting of the shade poured onto me a warmth that I had never known before. An old saying, invading my mind, destroyed the illusion, and laughing a bit nervously at "seeking his place in the Sun," I turned away and lay down. The dials on my new calendar clock registered 3:15, July 12. Reaching for my pad and pencil, I recorded this and then, refolding my hands across my chest, I lay quite still. The heat of the day had begun to saturate the closed room. Outside, all was quiet, as if the Sun had mesmerized the world. The insect hum of the electric clock was the only clue of life around me. Looming large above me in the mirror, the magnified reflection of my face calmed my mind with its placidity. Great-lidded Buddha eyes gazed down, holding in their glow my first understanding of Nirvana. I knew that it had come. I had reached the boundary where the fear of returnless going stopped the psyche just this side. My only body consciousness was the heavy thud ... thud ... thud of blood being driven through my veins. I toyed with stopping the thudding, feeling and savoring the pause between those sledge-hammer strokes on my brain—knowing that any one of those pauses lengthened to eternity was death. Suddenly I shrieked and sat upright. For an instant, my body had completely stopped and I had known it. Only a nameless grasping fear had snatched me back. My heart beat wildly as I gasped for air. With shaking hands, I poured a drink and gulped it down. It had been close. Still trembling, I arose and slumped into a chair. I had to organize myself, to think my way along this thing. This one thing I knew: I could do it. I could stop my body at will and I had done it, if only for a second. This thought reassured me or perhaps the brandy opened my reserve of courage, for I had been sitting in the chair some time. With caution, I approached the pallet. I regarded it with suspicion, as though there were a deadly scorpion in its folds. Then, jeering at my hesitation, I lay down and composed myself as before. The clock said 5:05. I stirred again only to record this on the pad. Despite my nervousness, things proceeded faster this time. A morbid excitement carried me along the path I now already knew. And at its end, I flirted with the stopping. Going over and stepping back, going over and stepping back. It was a pleasure exquisite and unique. Once felt, it was unresistable. I was no longer afraid. I did not have to be. I could stop my body and start it at will. So I let it slip away from me. The thuddings ceased and only the pauses remained—silent, shapeless things in endless procession. And then the great silence. It flowed over me and I was lost. The silence was too heavy and my thoughts were not my own; they floated up away from me in the silence. I could feel them go, but there was nothing to bring them back. Each thought of protest winged its way into a void with all the rest. And nothing else remained but the will to live. As the silence lapped around this will, it grew until it alone was I. The silence washed about it, but it stood. Then the little rippings and the slicings and the tearings and the softening of things were there—heard without sound, felt without feeling, like the pulling of a tooth from a novocaine-deadened jaw. It was then I saw the face. Have you ever felt the terror of suddenly waking with a face—a face of eyes—staring into your unguarded and bewildered first glance? One feels as if this face would look into one's very life and wrest it from him. Perhaps it is a nascent fear of one's own mask of death. But I could not escape the mask. It loomed above me with gaping maw and staring eyes; eyes that seemed more dead and deadly as my vision cleared. The mirror enlarged the horror that lay below it. It was the wrench of nausea that pulled me from this nightmare. In the violence of the retching, I rolled from beneath the mirror and raised myself to hands and knees. I had knocked over the clock and it shouted up at me—10:05, July 15. Three days! Too long! Too horribly long! Slowly I dragged myself to the telephone and pulled it from the stand. I remember nothing else until they brought me here. It's been eight days—eight days away from death, yet I'm closer to it now than ever before. And I can't think of it. The fear has come crashing through and I can't think. This thing, this body is too far gone. I won't be able to make it move. I'll just feel it getting away—little by little—ripping apart cell by cell, and then everywhere all at once. I can feel it now. But in that great silence, I could almost hear the tearing—yet there was no sound. The doctors have given up all hope. I can see it in their faces. I could hear them talking among themselves when they brought me in. They had to give it a name. There's a certain safety in a name, you know. I would have told them, but I was afraid they'd laugh. The nurses would laugh and say to each other, "Have you heard what the one in 408 wanted in his case history?" I couldn't stand the laughter now. But that's the way my chart should read—Cause of Death:—Death!